It was years since I'd last been to Alpheton. And yet, I'd been close by so many times while travelling along the busy Bury to Sudbury road. But I'd not visited the church since the 1990s, and it was now one of the few Suffolk churches I'd never been inside. When I'd come here then I'd found it locked without a keyholder notice, and I'd feared for its future. The setting could not be lovelier. You leave the village, pronounced Al-fee-t'n, with the stress on the middle syllable, up on the busy road, and follow the winding lane down and into the valley. It twists and turns, allowing tantalising glimpses of the church tower. After a little under a mile, you reach the valley bottom, and find the Hall farm and church together in splendid isolation. A concrete track leads around the farm, and brings you into the graveyard from the south east. This is a trim little graveyard, considering its remoteness. The 15th century tower climbs beyond a pretty 15th century wooden porch. The 19th century revival carved the words COME UNTO ME above the door. Nowadays the church is open every day. 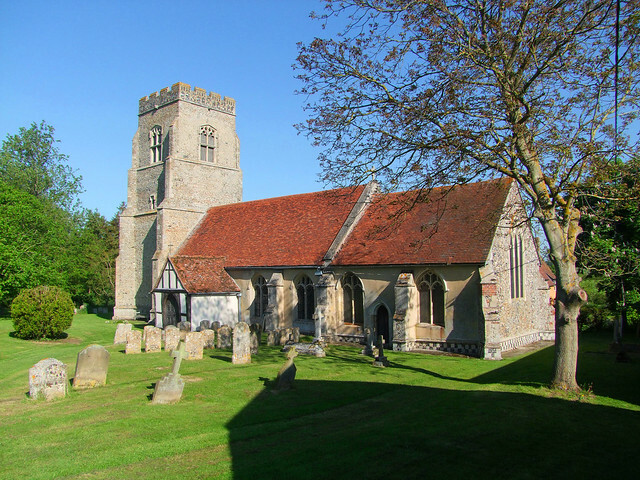 It forms more than a mere picturesque group with the Hall, for the Hall is now a wedding venue, and this seems to have encouraged the parish to promote the church for weddings. Effectively, they've gone into partnership. Now, I know there are rules for who can and cannot get married in a particular Anglican parish church, but I expect that these can be bent slightly, and it is in any case likely that they will be done away with altogether. And the atmosphere inside this church is utterly delightful: on this early morning in late May the sunshine poured in through the clear glass of the north and south windows, and the flowers filled the air with their fragrance. You can see why couples might want to tie the knot here. The east window is filled with modern glass of exceptionally high quality. This is the millennium window by Pippa Blackhall, and depicts the Risen Christ as a young man in modern dress. He is flanked by St Felix and St Fursey, the two evangelists of Suffolk, but also by scenes from local history - there are monks and an abbess, and there is Bury Abbey - and scenes of local life, including a tractor bringing in the harvest and a piggery. All too often, millennium windows appear to have been designed by a committee to suit the tastes of the lowest common denominator. That is not the case here, and it is outstanding of its kind. Alpheton church retains the atmosphere of 19th Century rural Suffolk, when it was restored to its present state, but also of a much older and more mystical time. 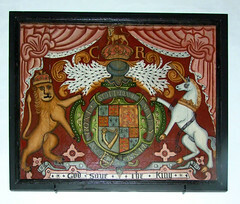 The set of Charles I royal arms which Sam Mortlock saw here in the 1980s appear to be no longer in situ* but nothing can remove the remains of the St Christopher wall painting opposite the south doorway, an unusual survival this far south and west in East Anglia. But best of all are the 14th Century niches and sedilia, of superb quality, extraordinary survivals. Both niches were crowned by elaborate canopies, one sadly mutilated but the other one with a grinning Bacchus. On the sedilia, a crowned figure stands proud holding two arms of what may have been a cross - might it have been a representation of the Holy Trinity? - while a lion skulks in the moulding. Several memorials recall the life of this little parish in years gone by. In 1905, Hannah Isabella Pearson entered into her rest. She had been Assistant Teacher in Alpheton National School. The post of Assistant Teacher in a National School was usually held by a young woman, so perhaps she died at an early age. Across from her is remembered Grace Adelaide Harvey, who entered into her rest at Felixstowe. In the chancel, we are told that Samuel C Mitchell was verger and gravedigger for 40 years. 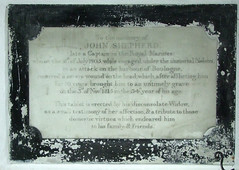 From an earlier century was John Shepherd, a captain in the Royal Marines, who fought under the immortal Nelson in an attack on the harbour of Boulogne. Of course, Nelson was not immortal, and indeed neither was Captain Shepherd, for he retired to Alpheton with the wounds he received in the Battle of Boulogne, and died of them there ten years later.